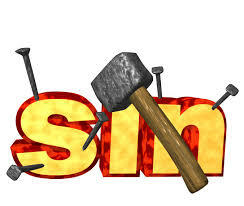 Are you tired of hearing about sin? It only happened to me one other time. I’ve been preaching regularly for the last thirty or so years. It’s a great privilege for which I have no credentials or pedigree for the assignment. I know it is from God. I enjoy the study. I enjoy praying for preaching. I enjoy the preaching event in a worship service. I enjoy hearing how God spoke to a listener and how their lives have been changed, even if just a little more. I can’t remember every sermon, just like listeners can’t. From week to week, most of us can’t remember what the pastor preached. But that is not as important as you might think. After all, if your wife has faithfully prepared you an evening meal for the last thirty or so years, can you remember each one? Probably not. But each one nourished your body and kept you going. Every now and then, one or two meals stick out in your mind – just like sermons. What prompted this latest complaint? I’ve been preaching through the first four chapters of Paul’s letter to the Romans. No wonder people might say they are tired of hearing about sin. By my calculations (I am not great mathematician! ), 57% of the total number of verses in these chapters speak directly to or allude to the human problem of sin. No wonder people are complaining. Think how Paul must have felt writing these chapters. I bet he couldn’t wait to get to 3:21 that says, “but now a righteousness from heaven has been revealed.” Whew! What a relief to hear that God saves the ungodly like David and Abraham. After darkness light! A friend of mine who analyzes public speakers and especially preachers, told me he listened to a number of my sermons on line and discovered something interesting. As he listened to the audience, he heard what he called “murmuring” when the subject of sin was addressed. He said there was a “grumbling” in the ambient noise of the auditorium. Here’s the sad part. If he is right, he is hearing Christians grumbling about sin. Not discontent about their sin, but grumbling about having to hear about it. Now, I will admit to a great storehouse of naiveté. Romans is the gospel; good news from beginning to end for congregations hungry to know God intimately. It is a great comfort and an important letter for New Testament believers that will build faith and endurance in the Christian life. It’s the book that drove Luther to the grace of the gospel. I believed it would be a great blessing to believers to hear about “so great a salvation.” Preaching what is there should humble the Christians with great joy in their saving God. He saved us from our sins and continues to save us from our sins and will ultimately save us from sin. His grace is written between every line of Romans and bursts forth often with explicit hope. So, why would Christians complain that they are tired of hearing about sin? Indeed, we should be tired of sin but should we tire of hearing how God solves our sin problem? In order to hear about the solution, we must hear about the problem to be solved. If through your preaching you convince me that I am unholy, I then resent your preaching. The preaching of the gospel awakens an intense resentment because it is designed to reveal my unholiness, but it also wakens an intense yearning and desire within me. God has only one intended destiny for mankind – holiness. His only goal is to produce saints. God is not some eternal blessing-machine for people to use, and He did not come to save us out of pity – He came to save us because He created us to be holy. Atonement through the Cross of Christ means that God can put me back into perfect oneness with Himself through the death of Jesus Christ, without a trace of anything coming between us any longer. Chambers was not specifically talking about preaching but the Christian priority of living a godly life. The word of God that reminds us of our sin is a good word. Sin reminds us that nothing is wrong day after day after day and wants us to be blind to its threat. To hear about our sin once a week and its divine solution is enough to war against sin’s lie and overcome its devious promises. No doubt, there are hard sayings in the Scriptures. But in the hands of the Comforter, who wrote the book, the remaining sins of the believer’s heart are his to reveal and to heal. He leads us in the fight against sin by ushering us to the rich mercies of Christ. The Spirit also convicts unsaved sinners of their sin so that they might run to Christ for forgiveness and freedom from sin. How often I have heard new believers testify how grateful they are to God for forgiving them and cleansing them of their sin. They feel relief, peace and warmly welcomed by their heavenly Father. Oswald Chambers, ed. By James Reimann, My Utmost for His Highest (Grand Rapids: Discovery House Publishers, 1963), n. p., September 1.